Young actors have stepped back in time to the First World War for a musical drama about conflict and comradeship – on the battlefield and in their home town. 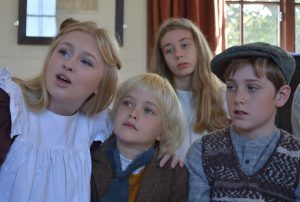 The Battle of Boat looks at the friendships and tensions among youngsters in a seaside community as their friend goes off to fight for king and country. 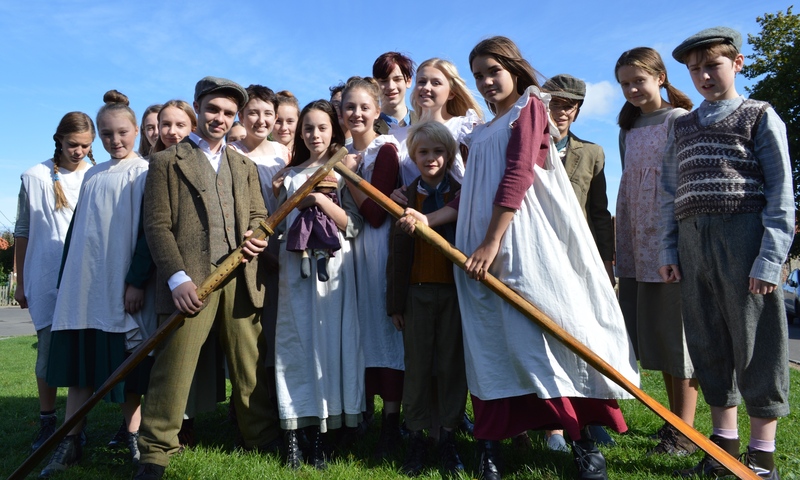 The cast, mostly aged between 16 and eight, are from the Sheringham Little Theatre’s youth group. They have been putting the finishing touches to the drama ahead of opening night this Thursday (September 22). An all-action script, brimming with powerful music, looks at how the teenagers’ desire to join their soldier friend sees them try recruitment, an air ship and a home-made boat – amid opposition from a suspicious rival gang. The show, directed by the experienced Adrian Connell, runs from September 20-22 (7.30pm and Saturday 2.30pm matinee). Tickets and information from 01263 822347 or www.sheringhamlittletheatre.com. Youngsters rehearsing The Battle of Boat. This entry was posted in Home Page, Sheringham and tagged Battle of Boat, coast, Sheringham Little Theatre, theatre, young actors on September 18, 2018 by Gay Webster.